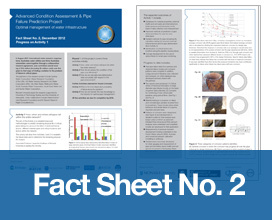 Fact Sheet No.2 – How, when and where will pipes fail within the entire network? The aim of the Activity is to establish improved methodologies to predict remaining physical life of critical pipes taking into account the effect of external/internal factors, different material types and critical locations and factors within the network. This activity will draw from Activities 2 and 3 to establish the failure state and to determine the remaining physical life of pipes. Associate Professor Jayantha Kodikara of Monash University is leading this Activity.